Trois etudes de concert #3 "Un Sospiro"
Nobuyuki Tsujii shared first prize with Haochen Zhang in the 2009 Van Cliburn Competition, as you may know one of the most prestigious piano contests in the world. Tsujii's triumph there was all the more remarkable because he has been blind from birth. He plays with amazing accuracy, an all-encompassing technique and exhibits a very mature interpretive sense. In sum, he is one of those rare musicians to have overcome a major handicap and succeed fabulously with his chosen instrument. I can think of only one other such classical performer to have achieved major success – the French pianist Bernard d'Ascoli, also blind from birth. 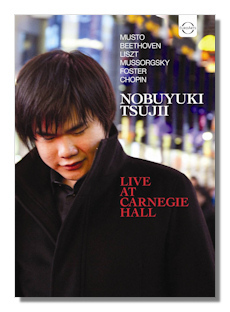 On this disc Tsujii chooses a varied program that opens with an attractive contemporary work and closes with his own heartfelt composition, Elegy for the Victims of the Earthquake and Tsunami of March 11, 2011. In between there are several challenging warhorses and encores. The leadoff piece, John Musto's Improvisation and Fugue, written for performance at the 2009 Cliburn Competition, divulges a sort of deft mixture of Schoenberg and Gershwin. Musto is not actually imitative of either of those two strange bedfellows, but his music to my ears calls to mind their soundworlds. Tsujii's performance of this difficult, nearly eight-minute work is brilliant and colorful, and makes you curious about further exploration of the output of Mr. Musto. Tsujii's reading of Beethoven's Tempest Sonata is certainly tempestuous in all three movements: in the first he is dark and driven, while in the ensuing Adagio agitation lurks beneath the stately and epic character, and in the finale white-heat angst propels the musical flow. A splendid interpretation through and through! Tsujii's Un Sospiro is nicely played, though a tad stiff in places. The Rigoletto Paraphrase is thrilling and spirited. His Pictures is certainly among the better performances I've heard: while Richter's 1958 Sofia recording is obviously hard to beat (despite a real nervous opening), this one is quite impressive too for a live recording. The encores go well: the Stephen Foster arrangement of Jeanie with the Light Brown Hair (made by Tsujii himself) is played in a lovely if slightly straightforward manner. The Chopin D-flat Major Prelude is given a beautiful though somewhat more aggressive treatment than what one usually encounters. Tsujii's own Elegy is a gentle, sad piece that sounds as though it almost could have been written by a crossover-oriented Chopin who infuses his piece with a few modest pop elements. His performance of it is beyond cavil. Following the concert, Tsujii breaks down back stage because he is overwhelmed by the audience's enthusiastic applause. The camera work and sound reproduction are first-rate. Tsujii is a major talent and this concert documents his considerable keyboard skills. Piano music mavens will certainly want this disc.